Facebook Inc. FB +0.25% ‘s announcement in February that it would buy messaging app maker WhatsApp for $19 billion in cash and stock triggered a wave of consolidation in the smartphone messaging space. In the most recent deal, South Korean mobile-messaging service operator Kakao Corp., which operates the Kakao Talk messaging app, agreed last month to buy local Internet portal operator Daum Communications Corp. 035720.KQ +7.11% , hoping to beef up its Web content on mobile devices. Kakao Corp. Co-CEO Sirgoo Lee Kakao Corp. Launched in March 2010, KakaoTalk is a free app that allows users to send and receive messages and voice calls. It makes money by selling games on its messaging platform, ads and by operating a mobile gift store. The company is dominant in Korea, but has been expanding in Southeast Asia. Kakao competes with WhatsApp in the U.S., Line Corp.’s Line messaging service owned by Naver Corp., as well as China’s WeChat, TCEHY -0.54%owned by Internet giant Tencent Holdings Ltd.
Kakao’s user base though, with 150 million users, is much smaller than its competitors. WhatsApp has about 500 million; Line has about 450 million and WeChat has more than 300 million users. On the sidelines of the Mobile Asia Expo in Shanghai this month, Sirgoo Lee, Kakao’s co-chief executive officer, sat down with The Wall Street Journal to discuss the company’s all-stock deal with Daum, which gives unlisted Kakao a valuation of 3.1 trillion won ($3.03 billion), its challenges and expansion plans. Below is an edited excerpt of the interview. 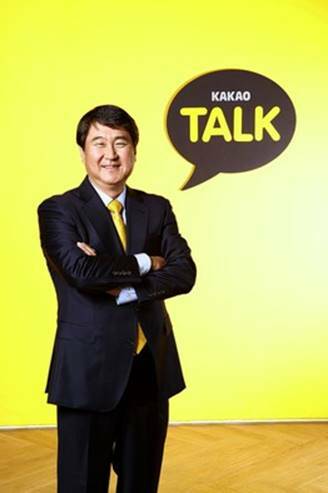 Career: Mr. Lee is co-CEO of Kakao since November 2011 after spending three years as vice president and general counsel. Before joining Kakao in August 2011, he served as CEO of the U.S. unit of South Korean gaming and search portal operator NHN. He also worked as a senior attorney for IBM Korea. Education: He holds a B.A. in East Asian history from Seoul National University, an M.A. in Chinese history from the University of Hawaii at Manoa, and a J.D. from Lewis & Clark Law School in Portland, Ore.
WSJ: Many people were surprised by the announcement that you would merge with Daum. What synergies do you expect from this deal? Mr. Lee: Daum is very strong in the PC Internet field. They have a lot of content that could be spread through our know-how, which is mobile. They are strong in search and have a lot of informational assets. Most of all, they have a great team. We, at Kakao, are a 600-member company. They have a strong pool of more than 1,000 engineers. We can integrate a massive pool of high-quality engineers in a very short time period, which would allow us to launch new services and new innovation in a short period of time. WSJ: It’s hard for messaging companies to make money, given that the service is free usually. What is your strategy to make more money? Mr. Lee: When you have that massive traffic, then you can do whatever is natural to come up with a business model. So monetization wasn’t a big worry for us. We’re just starting to see very innovative ways to make money. For instance, we make money off games and stickers but there are also advertisement models that we’ve been experimenting with, called Plus Friend. What you do is, in addition to adding individuals as your Kakao Talk Friends, you pick and choose among products, friends and services that you’re interested in and then…you can send targeted messages to them. Although monetization is important, it has to be natural to the user and it has to give them value. Doing display ads is disruptive for the users. WSJ: When do you expect the merger to close and does it mean you won’t be listing Kakao separately? Mr. Lee: We’re shooting for Oct. 1. Effectively it’s a backdoor listing. Daum Kakao, the new company, will be listed on Kosdaq. WSJ: You’re dominant in South Korea, but what is your overseas ambition? Are you looking at China, for instance, for growth? Mr. Lee: We’re focusing on three Southeast Asian countries—Indonesia, Malaysia and the Philippines. Being a small company with limited resources, we really have to focus on specific regions. We don’t have the marketing dollars to do the world-wide marketing campaigns. I wish we could have a marketing budget as big as Line and WeChat. WSJ: How big are you in those Southeast Asian markets? Mr. Lee: Indonesia being the largest, we have 17 million users. Before we started our marketing campaign in April last year, we only had half a million. So there’s been strong growth. In Indonesia, there’s a lot of competition with Line, WeChat and BlackBerry messenger is quite big. And so there isn’t a currently a No. 1 product in that market. WSJ: What about the U.S.? Is that a market that you’re looking at? Mr. Lee: We’re not looking at the U.S. currently, but it is a big market and we’d love to be in it. Myself, our chairman and our CFO even have been in the U.S. and have tried to do marketing in that country, and we found it’s very difficult, because messaging is a service where you have to be culturally sensitive. Until you have that understanding of the culture itself, it’s very hard come up with a service that becomes popular. So in the U.S., it is a very attractive market, but we’re taking our time. WSJ: With cybersecurity and privacy a big issue nowadays, what are you doing to make sure information about your users isn’t compromised? Mr. Lee: The biggest nightmare for me is some kind of privacy leakage. That would drive away all our users so we put priority No. 1 on data security. I, myself, am the chief privacy officer for the company. We received all sorts of data security certifications. I really don’t think it’s a concern for just us—it’s a concern for other companies. WSJ:You have a partnership with Yahoo Japan. How is Yahoo helping you expand in the country? Mr. Lee: I have to admit, it’s been pretty difficult because Line is doing so well in Japan. Japan was our first overseas market and we have 50 million users. We partnered with Yahoo in October 2012. It’s a 50-50 joint venture in Japan called Kakao Japan. We’ve been trying different strategies but the growth of Line has really dwarfed our service so we’re continuing the effort but we’re not growing as fast. WSJ: WeChat owner Tencent invested in Kakao. Have you been in talks with them about a potential increase in investment? Mr. Lee: We got a very good investment and an ally in China [Tencent owns about 13% of Kakao, worth $70 million]. Tencent started out as a PC instant messaging service. So they inherently knew then, and in mobile too, that messaging is going to be big. That’s why they made this investment. In addition to the equity investment, they kind of held out their hand and acquired a good partner into the future. I don’t know if Tencent would look at increasing its stake. Tencent has been actively investing in other services. WSJ: Are valuations getting out of control in the messaging space? Mr. Lee:Facebook has realized that there is that potential value to lock in users especially in mobile. It’s very different from the PC industry. We think it’s the future. The trend from web to mobile is happening at a much faster pace than we expected. And so in a very short time, you’re going to see new giants coming up that were very small companies. Why not companies like us or Line being the future leaders in this industry? WSJ: If you were to give your best management tip, what would it be? Mr. Lee:My mentor told me, you have to always think of shareholder value because underneath the corporate structure, shareholders are your boss. I continuously try to think in terms of what value am I going to create for shareholders.